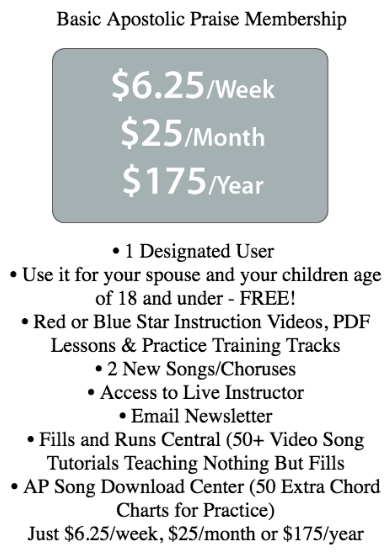 Start Learning for just $6.25! With Apostolic Praise Fills and Runs Central Membership you can get access to tons of videos showing fills, runs and songs – with more are being added regularly! WHAT IS FILLS AND RUNS CENTRAL? We are constantly adding more videos to it also. Great if you just want to learn fills. You can access as many video tutorials as you want. However, if you need to cancel, you can only download/print/save/screenshot up to 1 video + chord sheet per month of membership. In the past 10 years, Richard Smith has taught hundreds students of all ages and levels to play piano, bass, guitar, organ, and drums. He’s developed the most effective strategies and systems for learning to play in less time. Now you can take advantage of his experience and proven step-by-step training to be playing better in your first year than most self-taught students learn to play in years. • Use it for your spouse and your children – FREE! Richard W. Smith has been playing for so long that he has forgotten how young he was when he started but it was around six years old! He possesses a love for and ability to play a wide variety of musical styles including black gospel, jazz, blues, contemporary gospel, southern gospel, classical, and Latin style. ​​He has been teaching piano lessons for many years to people of all ages. This is why you will find our courses easy and simple to understand, learn, and follow.